The PCRecruiter team is heading into the Thanksgiving holiday, for which our offices will be closed on Thursday, November 22 and Friday, November 23, with some new updates to our software and to our services. You’ll notice that we’ve got an improved support chat system. 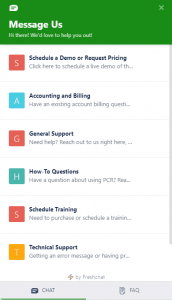 The live chat icon is located both on the PCRecruiter company website and at the lower-right corner of your PCRecruiter login screen. Clicking this icon will now present you with options to route your inquiry to specific departments. This update will not only help us to expedite our customers’ requests, but it is also a step toward more efficient and powerful support options we are planning for the future. 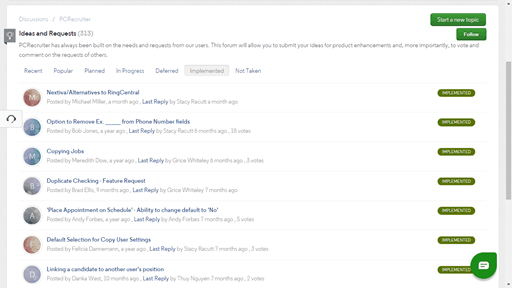 We’ve also been seeing remarkable results from the suggestions made by PCRecruiter users in the Ideas and Requests forum. PCRecruiter has, from its very beginnings, been built on the requests and ideas of the professionals who use it. Over the past several months, this forum has proven invaluable in helping us to better understand the needs of our users, allowing for discussion and voting on their great suggestions. Dozens of the recommendations born in the forum have already been planned or implemented, and we invite you to join in the conversation. We’ll be posting more specifics about changes in the v.9.7.20 update released this morning when we return to normal business hours next week, including the details of our exciting new Candidate Presentations tool. To our users in the U.S., Happy Thanksgiving! You guys continue to be nothing short of AWESOME! I give thanks to all of you!